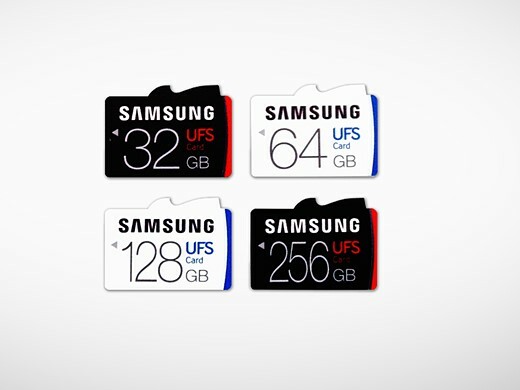 Samsung has announced that it intends to produce the first removable versions of a new format of memory cards designed, it says, to replace the microSD card in portable electronic devices such as cameras, drones and phones. The Universal Flash Storage cards are as small as microSD cards but boast enhanced read/write speeds, with the company claiming that 5GB can be read in just 10 seconds at a rate of 530MB/s. The write speeds a less impressive however, with a quoted maximum of 170MB/s, but Samsung says that is still almost twice the speed of a top end microSD card. The company says its cards will write at 170MB/s, which compares well to the 100MB/s rate quoted by SanDisk for its Extreme Pro UHS-II cards. The same SanDisk card reads at 275MB/s. Although the format was announced in a white paper (pdf) in 2013, and Samsung announced its plans in February, this is the first time the cards appeared to become a reality with compliance with the Joint Electron Device Engineering Council (JEDEC) standards. The company expects to introduce capacities of 32, 64,128 and 256GB, but hasn’t said when or whether there will be devices to take them. 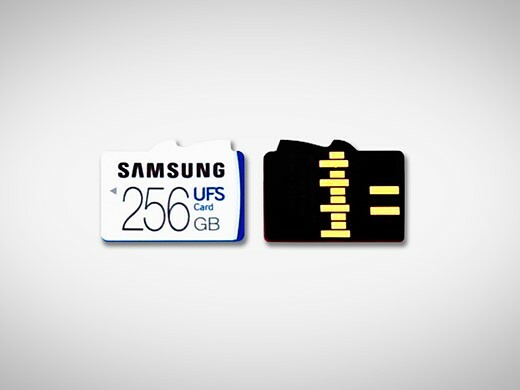 Samsung’s new 256GB UFS removable memory card ? simply referred to as the UFS card will provide greatly improved user experiences, especially in high-resolution 3D gaming and high-resolution movie playback. It provides more than five times faster sequential read performance compared to that of a typical microSD card, reading sequentially at 530 megabytes per second (MB/s) which is similar to the sequential read speed of the most widely used SATA SSDs. With this UFS card, consumers have the ability to read a 5GB, Full-HD movie in approximately 10 seconds, compared to a typical UHS-1 microSD card, which would take over 50 seconds with 95MB/s of sequential reading speed. Also, at a random read rate of 40,000 IOPS, the 256GB card delivers more than 20 times higher random read performance compared to a typical microSD, which offers approximately 1,800 IOPS.